It is a kind of professional bathroom spy camera. If you have the need to shoot some videos in the bathroom, this product will help you so much. Its appearance is a beautiful electric toothbrush. 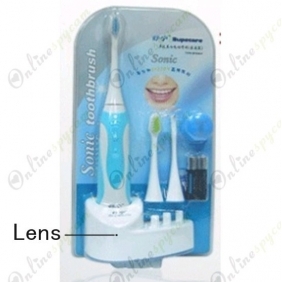 To achieve the function of shooting, a tiny but high quality spy camera is set inside the toothbrush. The camera is waterproof, so even if you use this toothbrush for cleaning teeth as usual, there is no harm to the camera. The camera’s resolution reaches 1280x720, so the quality of the videos is no problem. With its high-grade battery and 16GB memory card, the camera can work about 10 hours. No wonder it can shoot long time wonderful videos with clear voice. There are many interesting things. If you want to record them without notice, this product is a good choice.